Maybe we should not define world what actually is just a part of it, but by that time, in the Middle Age I mean, the transoceanic continents had not been discovered yet and the world borderlines were supposed to be around Europe, Africa and Asia. And, as a popular saying states, all roads lead to Rome… passing through Tuscany! Well, maybe not all roads, but our region was a stopover place on many journeys, especially during that time. 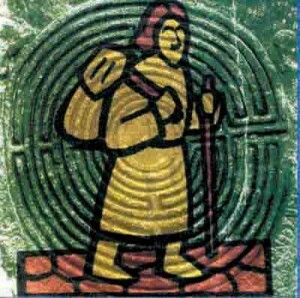 It seems quite impossible that during the Middle Age a road could put on to the extreme limits of a continent with no means of transport…But if you do not believe it, ask all those pilgrims who, step by step, used to cross Europe to reach Rome, or Santiago de Compostela, or even the Holy Land sometimes! I am talking about one of the oldest road of Europe which, originally aimed at top security commercial trades leaving from the Frankish territories to Rome, became the Pilgrims’ Road as time went by. The result is that people used to come from any corner of Europe for visiting Paolo the Apostle’s grave, making a connecting, junction place out of Italy and Tuscany, where differently cultured people met, creating a melting pot of their own features, and thus contributing to shape our regional identity, as well as our national one beyond any doubt. It is a matter of fact, then, that Tuscany has not casually always been renowned not only for the beauties of its landscape and the works of art it jealously preserves, but also for its welcoming, friendly-natured inhabitants, who have always greeted anyone interested in discovering their treasures with a smile. Is there a better heritage that centuries of history, memories and personal experiences could hand us down? I do not think so. Each corner of our land reminds us of the past times, each old stone keeps a secret to be softly told, each narrow street represents a chapter of “our history book” and thus should be told separately but, as “the Romei pilgrims” teach us, whatever we would like to undertake, we should face it step by step. And this time we would like to stop over a little, medieval village located in the province of Lucca: Altopascio. I often go there and every time I go for a walk around the little and narrow streets of the old town centre, the smells and colours of the past seem to “come back to life” to show me the past life just for a while… I am sure that if Altopascio, with its stories, had not existed, our Tuscany would have not be the same…and now I could not tell you who the “Knights Tau” were. It is said that, after the beginning of the eleventh century, twelve knights from Lucca founded a hospital facility just in the little town of Altopascio, situated on the Francigena Road, that is where lots of pilgrims and wayfarers alternate, being on the road to Rome or back from it. Those who walked hundreds of kilometres to reach the papal city necessarily needed medical care and hospital treatments, as well as protection from eventual barbarians and villains. And this is how one of the most important health care centre of the medieval Europe originated, due to the work of a chivalrous, religious order who chose the Greek letter T, called TAU, as his own distinguishing symbol. As time passed by, the white symbol on a black background in this specific case, due to religious and historical influences, began to be related to the cross and, as a consequence, to intrinsic Christian meanings of purity and charity.